Vajrapani (Sanskrit Vajra:thunderbolt/diamond, Pani:lit.in the hand; chn. Jin Gang) is one of the earliest bodhisattvas of Mahayana Buddhism. He is the protector and guide of the Buddha, and rose to symbolize the Buddha’s power. Vajrapani was used extensively in Buddhist iconography as one of the three protective deities surrounding the Buddha. Each of them symbolizes one of the Buddha’s virtues:Manjusri (the manifestation of all the Buddhas’ wisdom), Avalokitesvara (the manifestation of all the Buddhas’ compassion) and Vajrapani (the manifestation of all the Buddhas’ power). On the popular level, Vajrapani, Holder of the Thunderbolt Scepter (symbolizing the power of compassion), is the Bodhisattva who represents the power of all the Buddhas, just as Avalokiteshvara represents their great compassion, Manjushri their wisdom, and Tara their miraculous deeds. For the yogi, Vajrapani is an archetype deity of fierce determination and symbolizes unrelenting effectiveness in the conquest of negativity. His taut posture is the active warrior pose (pratayalidha), based on an archer’s stance but resembling the en garde position in Western fencing. His outstretched right hand brandishes a vajra and his left hand deftly holds a lasso — with which he binds demons. He wears a skull crown with his hair standing on end. His expression is wrathful and he has a third eye. Around his neck is a serpent necklace and his loin cloth is made up of the skin of a tiger, whose head can be see on his right knee. 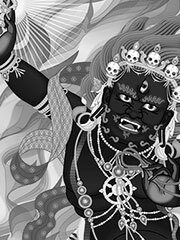 Vajrapani is believed to be the savior of snakes (nagas), and since the Nagas are believed to control the rain-clouds, Vajrapani as their protector is looked upon as the Rain God, and it is to him Buddhists appeal when rain is needed, or is too abundant. In this capacity Vajrapani is identified with Indra, the Indian god of Rain. The first representations of Vajrapani in India associated him with the Hindu God Indra. As Buddhism expanded in Central Asia, and fused with Hellenistic influences into Greco-Buddhism, the Greek hero Hercules was adopted to represent Vajrapani. He was then typically depicted as a hairy, muscular athlete, wielding a short «diamond» club . Mahayana Buddhism then further spread to China, Korea and Japan from the 6th century. In Japan, Vajrapani is known as Shukongōshin (執金剛神, «Diamond rod-wielding God»), and has been the inspiration for the Niō (仁王, lit. Benevolent kings),the wrath-filled and muscular guardian god of the Buddha, standing today at the entrance of many Buddhist temples under the appearance of frightening wrestler-like statues.